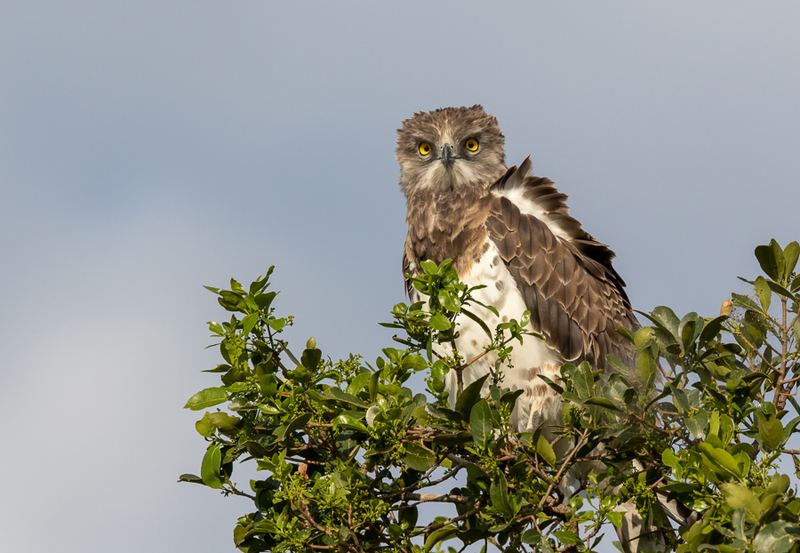 I went on a dedicated photo trip to Kenya with the objective to bring home some fine images besides enjoying the amazing wildlife on the savanna in the good company of my wife and fellow photographers. On my first safari in 2016, I had the tendency just taking a lot of documentary images being my first time. Therefore, I hoped to be more relaxed on this second trip and more selective before hitting the shutter in order to get better photos. 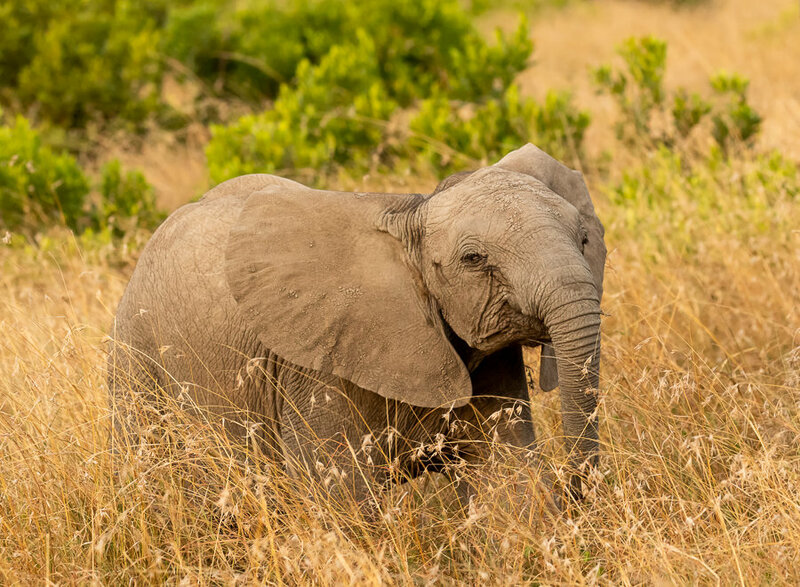 Like the first visit we stayed at the eco friendly Karen Blixen Camp in Mara North Conservancy. It is a great camp with 22 luxurious tents and you really enjoy the place and the amazing staff. 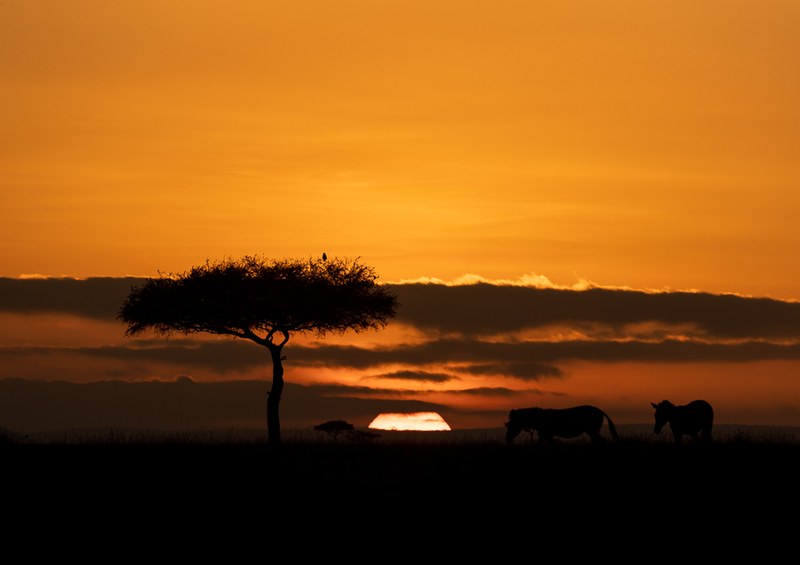 The Mara North Conservancy is one of the new conservancies created in 2009. 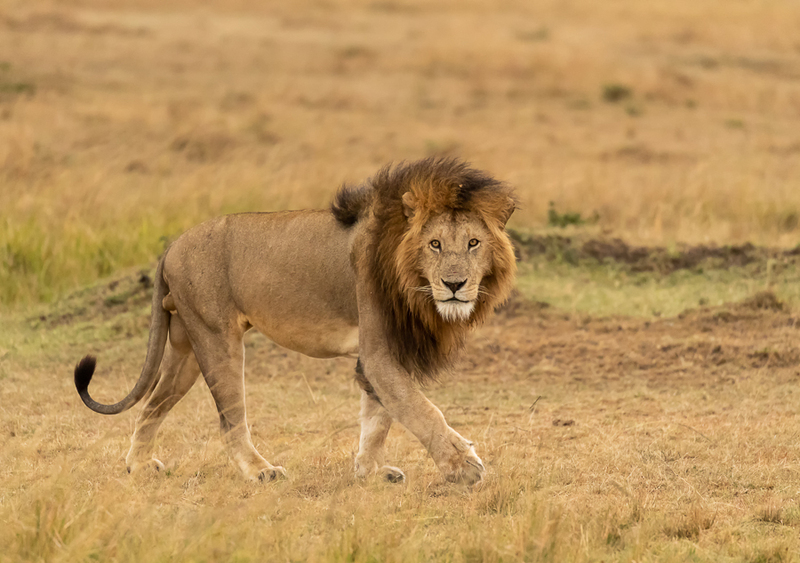 It lies adjacent to the well known Masai Mara National Reserve and covers an area of 30,000 ha being only 20 percent the size of the National Reserve. One huge advantage is that you are allowed to drive off-road as it is a private reserve. Therefore, we can get very close to the animals. Each day, we went out at 6 o'clock in the morning before sunrise to be with the animals when the light is at its best. Also, this is the time when the wildlife is most active. As the light became too harsh we returned to the camp by 9 o'clock for breakfast. In the afternoon, we started at 4 o'clock and stayed out until it was too dark to take pictures. Back at the camp we finished the day by having a nice dinner before bedtime - you don't get much sleep! Obviously, we came across the same kind of animals as on the first trip. This time though, we had the fortune to see more lions. In one day we counted 18 lions including two newly born cubs. 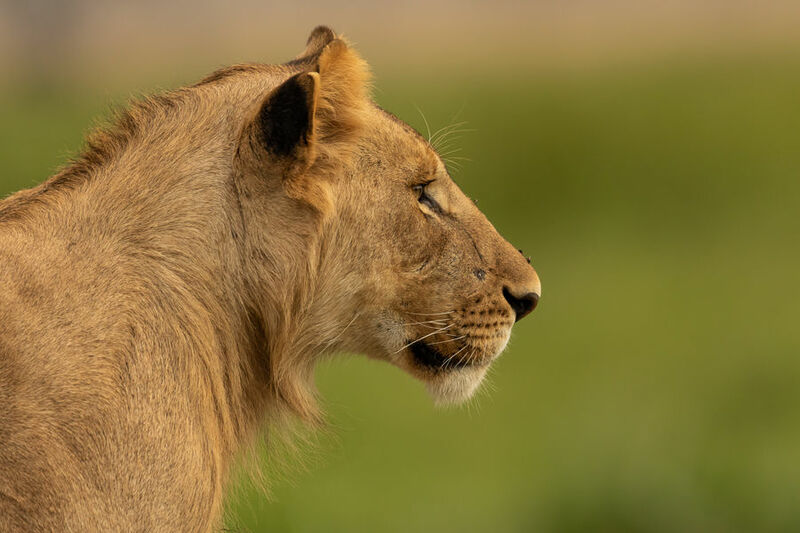 King of the savanna - and he knows it! One morning we had a very special experience. A dead elephant had been spotted and we went to the place as did many other cars. 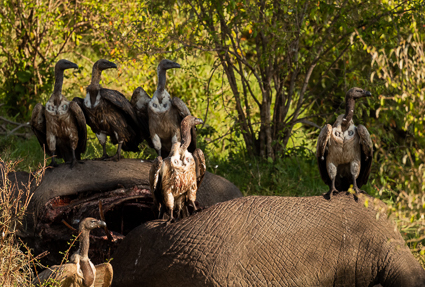 It turned out to be quite a feast for a huge number of vultures and hyenas. Exciting to watch although based on a sad event. 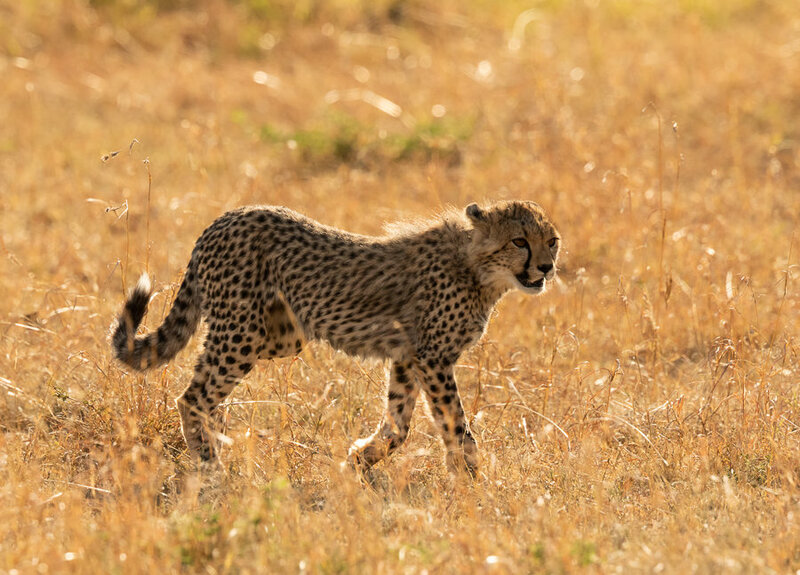 Also, we had the pleasure of the good company by two cheetah brothers on the savanna. 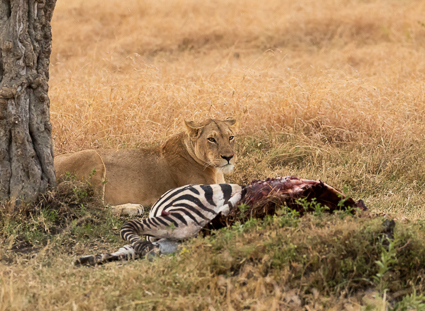 Once, they ate a kill and on our last afternoon safari we witnessed them catching a wildebeest. 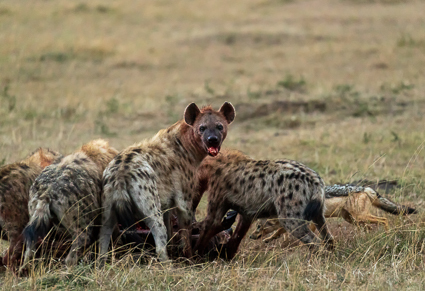 However, they had to abandon their kill due to a strong group of hyenas. 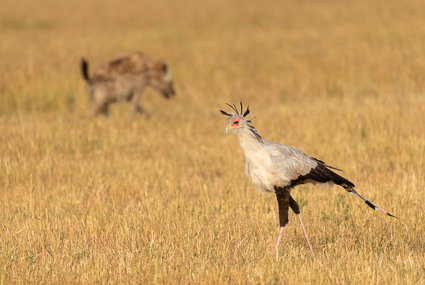 Apart from the many different mammals on the savanna there are also a huge variety of birds. 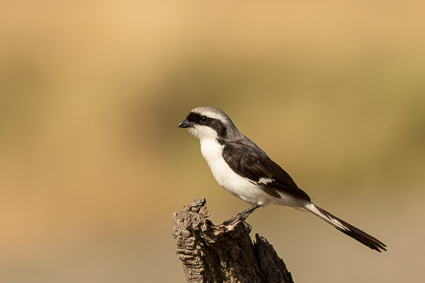 On this trip, we did not spend much time photographing birds, but I got a few decent shots after all. 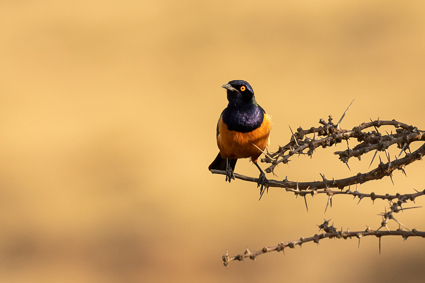 One morning we went to the Masai Mara National Reserve. The objective was mainly to try finding a leopard. Unfortunately, we did not succeed. 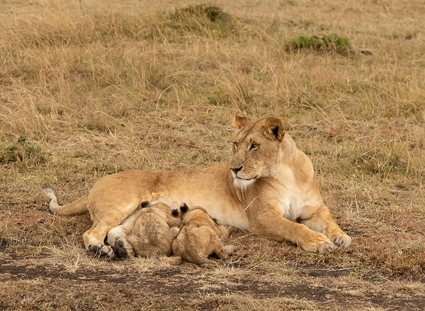 Still, it was nice to be in the Masai Mara again and we enjoyed some fine animals as cheetahs and elephants. 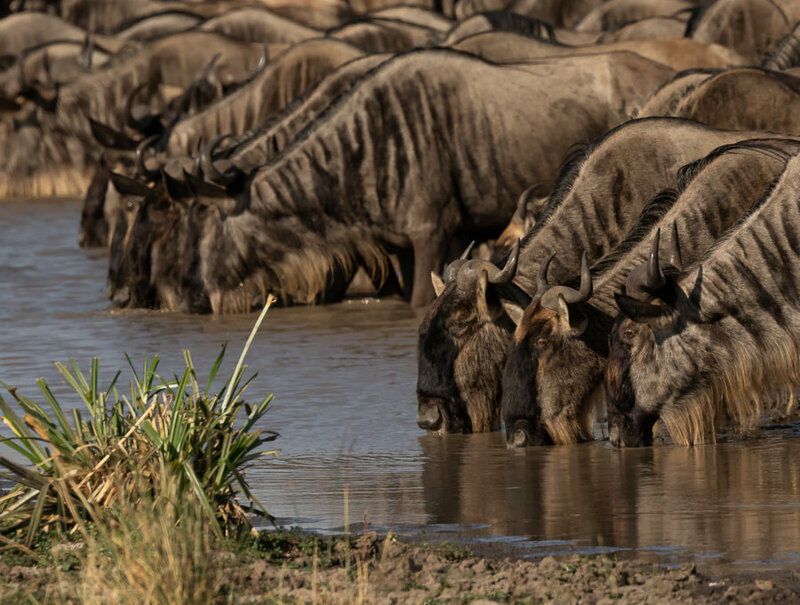 Also, we saw a huge group of wildebeest drinking from a pond. Actually, on this trip there were lots of wildebeest compared to our last visit. You could think it was due to us being one month earlier this time and therefore the great migration had not finished yet. However, we were told by our driver Peter that these wildebeest were locals. Furthermore, the great migration had been abnormal this year. 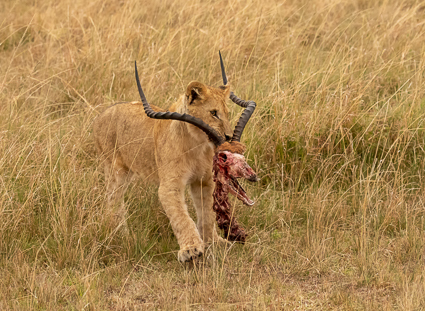 Due to more rain than usual on their route from Serengeti the wildebeest, zebra and Thomson's gazelles did not need to go that far to get green grasses. Following lunch at the camp we returned to Masai Mara in the afternoon. We would have liked to see a rhino but there had been no observations in the Mara Triangle where they usually reside. Therefore, we went to the Wetlands to find some lions and elephants instead. 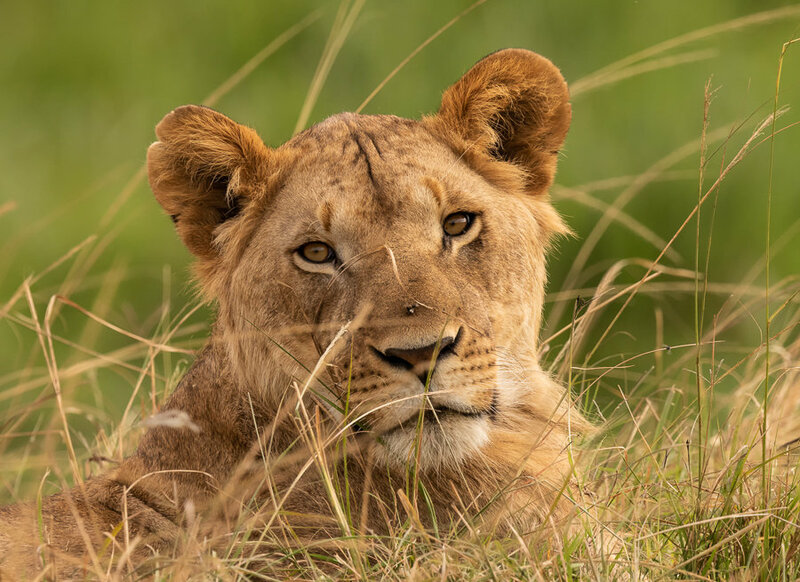 Soon, we met four lions resting on an elevation in the nice afternoon sun and had the opportunity to take close up images with a nice green background. Later, we found a male lion beside a female both asleep. After a short while all the other cars left as nothing happened. However, I managed to persuade my fellow photographers to be patient. 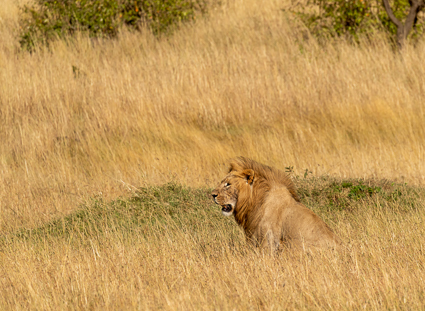 About twenty minutes later, the lions suddenly raised and mated just in front of us - what an experience! 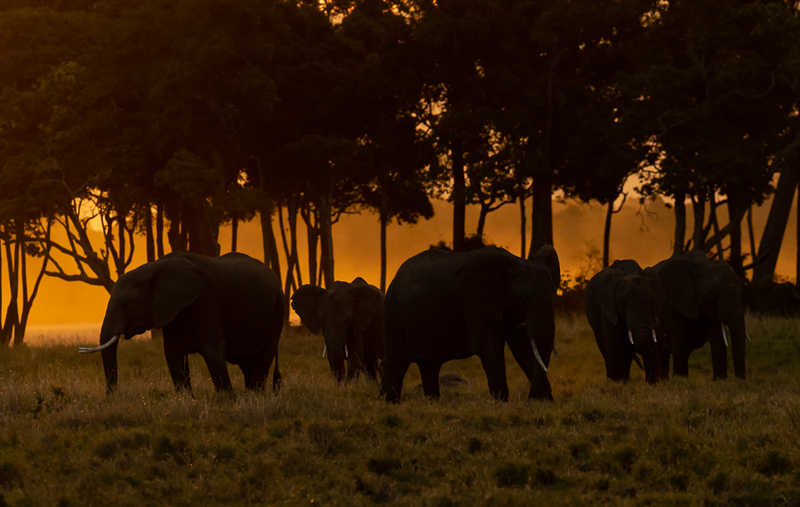 Just before sunset we drove up to a group of elephants grazing at the wetlands. Behind the trees the setting sun created a beautiful light crying out for images. 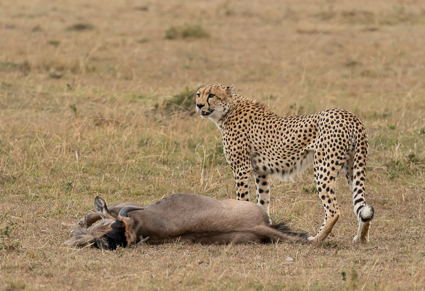 A great day in the Masai Mara despite the lack of leopard and rhino. 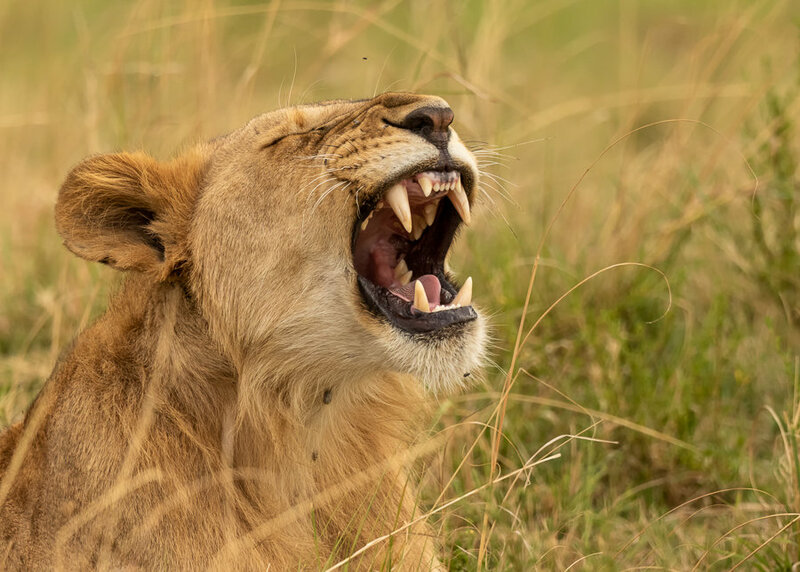 Due to an error with our entry permit we were still allowed to go to the Masai Mara National Reserve on the next morning until 9 o'clock. Therefore, we decided to return trying to find a leopard. 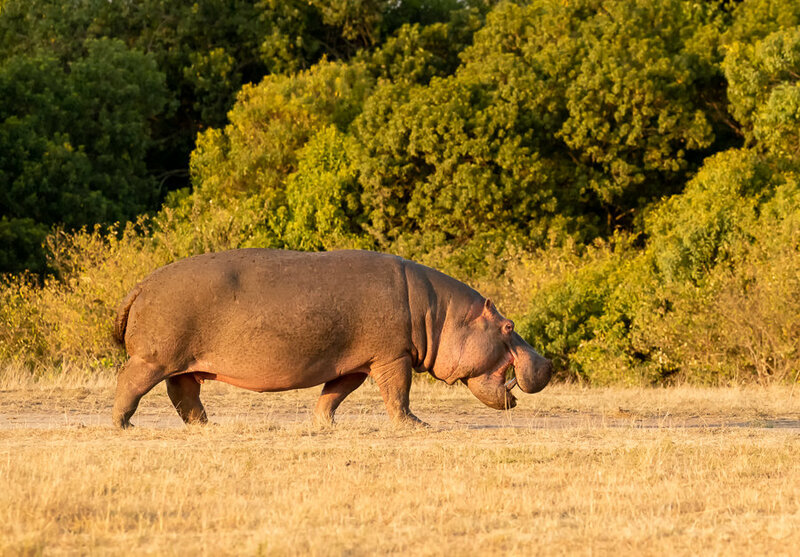 While searching a huge area for leopard we encountered a hippo. It is not often that you see a hippo walking on land during daytime so I felt lucky to take a few images before it entered the bushes. Shortly after, we had to cross a minor watercourse. As often before, we drove slowly down the steep slope. As we reached the bottom and the driver was about to connect the four-wheel drive the hippo from before came running against us from the right hand side with its huge mouth wide open. The driver hit the gas pedal and the car nearly overturned as we came up the slope in front of us - we escaped the hippo by about three metres! Unfortunately, I did not get an image of the chasing hippo but at least we were still alive and a once in a lifetime experience richer. 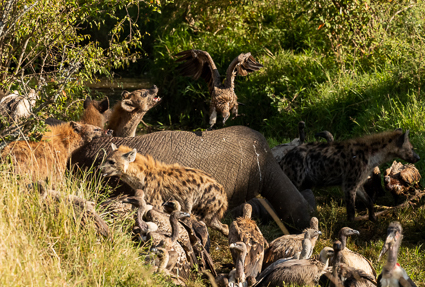 After this frightening hippo encounter we continued the search for leopard. Suddenly, we saw two cars in front of us waiting by a tree - they had spotted a leopard! Only a few minutes later the leopard went down. In the meantime, more than 30 vehicles had gathered around the tree and we had difficulties getting into position. At least, I managed to get a few shots of the leopard but I actually felt bad about the experience. I have to admit, that taking great images on a safari is difficult. Firstly, you rely on the animals being in nice surroundings and beautiful light. 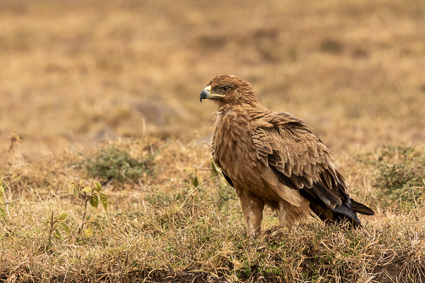 Most often, they are just standing on a dull spot at the savanna. Secondly, you are restricted to a seat in a safari vehicle and cannot shoot from ground level to get the optimal perspective. Besides, you are not alone! When e.g. 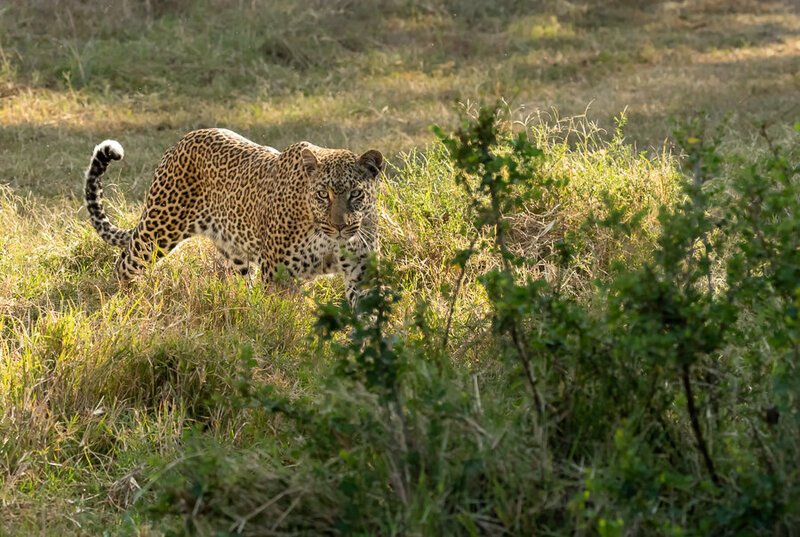 a leopard has been spotted it is only a matter of minutes before the savanna looks like rush hour. 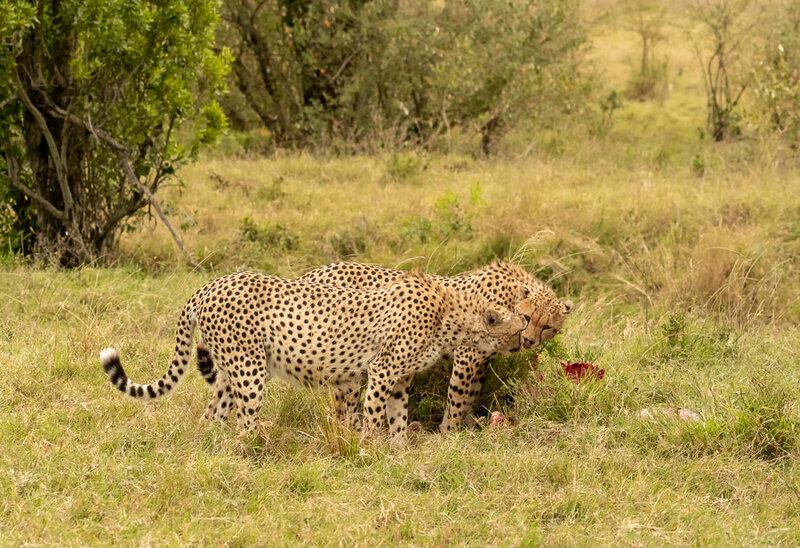 Especially in Masai Mara National Reserve it is a bloody mess. Last, but not least - you get excited! Just for the record, I enjoyed this second trip just as much although my objective to get better images was not fully achieved. 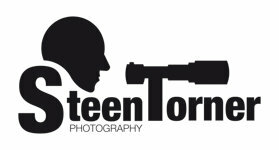 However, I managed to bring home some other kind of images to my portfolio.